When and how did the Huygens probe land on Titan? After riding with the Cassini orbiter for more than seven years, Huygens separated from Cassini on December 25, 2004. It cruised for 2.5 million miles (4 million kilometers) on its own, and entered Titan’s atmosphere on January 14, 2005. 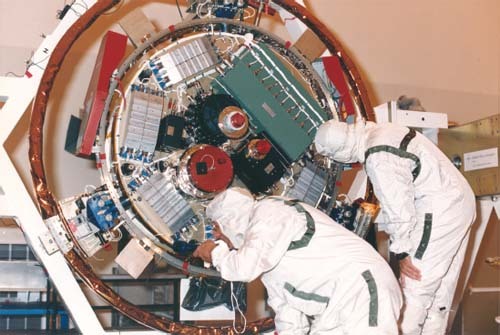 In an example of wise scientific double-checking, the separation and insertion dates were changed years after the mission was launched because it was discovered that a flaw in the computer software would have caused all of the data transmitted from Huygens to be lost. The new insertion date, which was selected so that the relative motion between Cassini, Huygens, and Earth would allow transmissions to be successfully received, was a month later than originally planned. Huygens hit Titan’s atmosphere traveling more than 12,000 miles (19,300 kilometers) per hour. A series of parachute deployments slowed the probe down to less than two hundred miles per hour. At an altitude of seventy-five miles, a final parachute was deployed that slowed Huygens further; after more than two hours of falling, Huygens landed on the surface of Titan at a speed of just ten miles per hour.